Previously we talked about the full tire size nomenclature for Passenger and Light Truck applications. In this example, the various numbers and letters are similar to those for Light Truck except the Load Index numbers and Speed Symbol are optional so may not be marked on the tire sidewall as part of the complete size nomenclature. The Load Index 138/134 and the Speed Symbol "M" make up the Service Description. If this is on your tire please include it when asking a question. This is an old “Inch” size description with the tire being about 11” wide. This would be a tubeless type tire. This is another old “Inch” size description with the tire being about 8” wide. This would be a tubeless type tire with the example showing the optional Load Index numbers and Speed Symbol. The two Load index numbers signify that the tire is rated for a higher load in single application and a lower rating when in a dual fitment. The Speed Symbol for TBR tires are associated with the following MAXIMUM operation speeds. If no Speed Symbol is marked on your tire you need to consider the tire is rated for a MAXIMUM of 65 unless you can find printed documentation from your tire manufacturer stating some higher speed limit is acceptable. If you are writing to ask a question about your tires please include the complete nomenclature including Load Index, and Speed Symbol if marked on the tire. In July, MOTORHOME magazine published an article on TBR tires. The author offered his personal opinion that it was acceptable to set inflation higher than the Max marked on the sidewall of a truck tire. 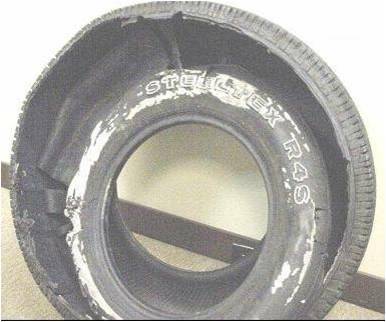 Exceeding the max cold inflation on the sidewall has serious potential safety consequences. Large TBR tires have been known to explode and personal injuries and even deaths have occurred when proper inflation procedures are not followed. I can find no industry guidelines that allow this procedure of exceeding the maximum inflation when setting the pressure for normal highway application of any tire. Rims also have a Maximum rating for both Load & Inflation. Many wheels have these ratings marked on the rim. If you can’t find that information I strongly suggest you contact the manufacturer and obtain the ratings for your rims. Again Serious injury or even death can occur if a rim fails due to damage and overinflating or improper assembly. Accuride Safety information and Product Literature you can consult. Alcoa also has product literature online. Whenever we are talking about setting the inflation in a tire, we are talking about “cold” inflation. This means the tire is at ambient temperature and not warmed from operation or sitting in the sun. I would suggest the tire not be driven more than two miles in the last hour and not in direct sunlight for at least two hours. When I did my tire cover study – See my post from June 16 on Tire Covers, I saw almost 40° increase in tire temperature in about one hour for a tire in full sunlight. 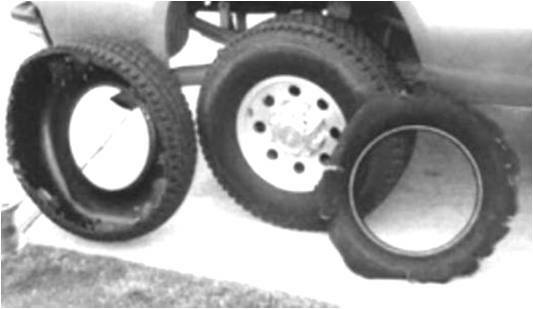 I would strongly suggest you never attempt to inflate a TBR tire if the tire beads are no longer fully seated against the rim without using an approved Safety Cage. If there is a problem, the tire and wheel can separate and components can easily go through concrete block wall never mind the side of an RV. 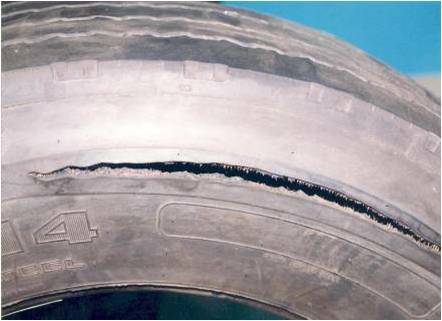 Any tire that has lost more than 20% of its rated inflation is considered flat and if it was driven on in a “flat” condition it needs to be dismounted and inspected by trained tire company store technitians. Not a Mom & Pop garage but a store run by a tire manufacturer. Too often that is one of the first responses’ I have to make when asked a question about tire replacement. The reason is that 98% of the time the person asking the question does not provide the details needed to allow me or other tire engineers to make an informed answer to the question. None of these “sizes” provide what I consider the complete size nomenclature. Here are some facts from the Tire & Rim Association industry standards book that point out why having all the information is both helpful and important. To help understand the nomenclature the “P” or “LT” or “ST” is the type tire i.e. passenger, Light Truck and Special Trailer. The numbers are related to the physical dimensions of the tire with 235 being the overall width in mm. The 75 is the ratio of the height of the tire from rim to tread and the 15 is the nominal rim diameter. Hopefully everyone knows that the “R” means radial construction. LR stands for Load Range with P type tires being LRB which usually means the max inflation is 35 psi but no one uses that designation as it is considered “standard”. P type tires can be rated XL for Extra Load or “Reinforced” and tires with either of these identifications would have a max inflation of 41 psi marked on the tire. The rest of the letters C, D, E etc are related to the maximum inflation for that size. NOTE not all tires with the same Load Range letter are rated for the same max pressure. An example would be the LT275/70R16 LRC is rated for a max inflation of 50 psi while the LT305/70R16 LRD is also rated for 50 psi max. Now what about those numbers and letters such as 101/104Q? The “Q” is the maximum speed rating symbol and the numbers would correspond to the Load Index for Dual application and Single application. There is a table that identifies the load in pounds that correspond to the index. The simple way to think of why this is there and how it can be useful is to think of how you can decide if a different size tire can be used. If the Load Index number is equal to or higher than that would be an acceptable replacement. All these examples relate to P, LT or ST type tires. I will provide another post focusing on larger Truck-Bus type tires some of which have a completely different dimension nomenclature. I guess I was in too much of a hurry to post to be sure I covered all the bases. Thanks to Al for pointing this out. NOTE I have not covered TBR tires. I will try and do a better job in that post. That’s an all too often statement heard from RV owners. According to some data a significant portion of RV owners have experienced a tire failure in the past two years. All too often the tire is blamed but my experience from examining thousands of “tire failures” is that the vast majority of these failures can be traced to the service conditions and not some so-called defective tire. Let’s look at a few examples. This picture shows the classical “Three piece Flex Failure”. I bet you see a tread ring like this almost every day in your travels. This tire was one I did an “autopsy” on. 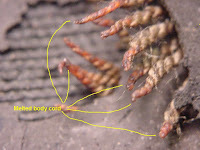 Looking at the “broken edge of the sidewall we can see hard body ply cord. 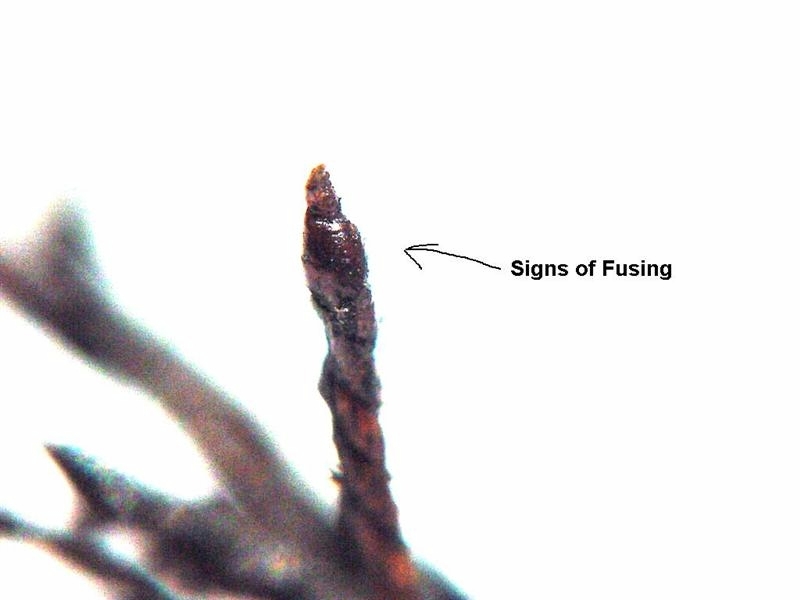 Taking a microscopic look at just one end we easily see the fused cord. This is much like what we have all seen when we cut Nylon or Poly rope and then melt the end with a match. Click on the picture for a better view. It takes excessive flexing at a high rate to generate sufficient heat to melt the cord like this. 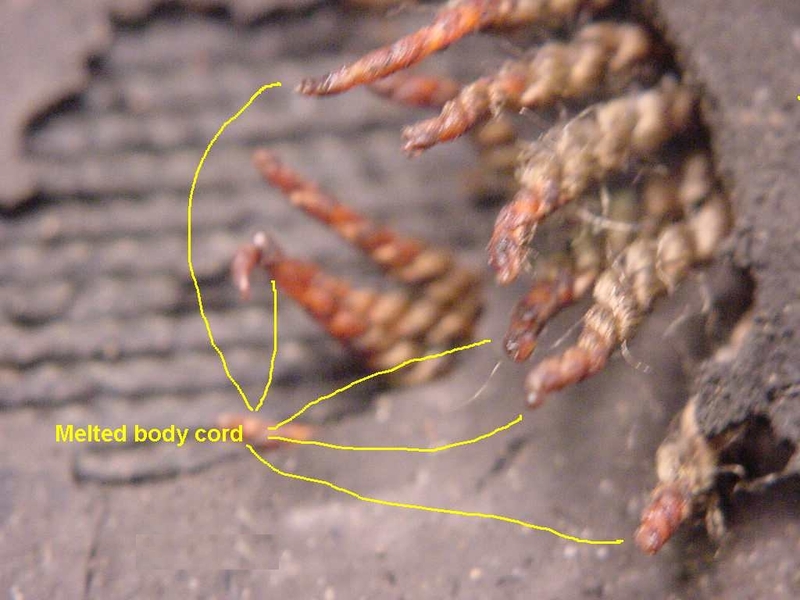 This Body Ply cord melts at approximately 495°F. I usually say the tire was operated at less than 20% of the proper inflation and at normal highway speeds to generate this level of heat. Before you say “Ya but I have steel body ply so it’ can’t melt”, just think about how easy it is to break a paper-clip by flexing it back and forth. Here you are looking through the hole in the sidewall of a 22.5 size tire that ran low at highway speeds but lost it’s air because of a bad valve leak. 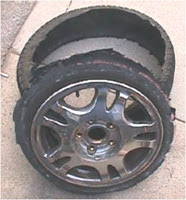 Next time you see a tread ring by the side of the road or hear someone say “I had a blowout” you now know one of the probable causes. Finally, You might ask if there is a way to prevent a sidewall flex failure. I believe that if you have a properly functioning TPMS it should warn you before the tire has lost 20% of it's air. If still inflated to this level it isn't considered officially "flat" and I have never seen a tire that can generate the heat necessary to fail a sidewall if it hasn't been run "flat". 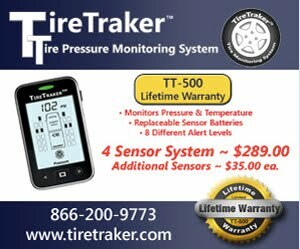 If you can set your TPMS to warn you if you either loose 10% of your air pressure or it sees a temperature over 170°F in most cases you will have sufficient warning to avoid this type of catistrophic failure.